It's easy to forward one email address to your real email account, but sending email to look like it came from that forwarded address isn't as obvious. There are services that automatically forward mail from one email address to another. Registering your own internet domain is a common example. Most registrars will offer to forward email sent to that domain to an email address you specify. Say you register "example.com" and email sent to example.com is forwarded to your real email account. What if you want to send mail that looks like it came from example.com? In most cases it's not difficult, but exactly how depends on your mail program and perhaps even your ISP. you@yourisp.com is your "real" email address. Obviously you have a real email address that is not actually "you@yourisp.com", but we'll use this example in this discussion. You get your email from yourisp.com and everyone knows to email you at "you@yourisp.com". Email you send is marked as "From:" you@yourisp.com. example.com is the domain you've just registered, and/or me@example.com is the email address that is being automatically forwarded. Any email sent to "me@example.com" is automatically forwarded to "you@yourisp.com". Exactly how and where you'll make these settings will vary based on your specific email program. There's a small chance that your program doesn't support all of these settings though most do. Web mail services such as Hotmail, Yahoo, and the like typically do not. The account should not download email unless it's to be your only account. Your email arrives via your regular account only. Depending on your ISP, you may need to select outgoing authentication on send. Options include specifying your ISP's account and password again, or possibly somethign called "POP before SMTP", meaning that your ISP will authenticate your sends if you first download email (with your real account). Caution: this is the step that may cause your ISP to reject sending using your custom email address. Some ISPs in the interest of thwarting spammers insist that email you send must be "From:" the email address that the ISP assigned you. Fortunately those ISPs are becoming fewer and fewer, but unfortunately if your ISP enforces this restriction there's very little to be done. You'll need to use another service to send your email. Once you've defined that email account, you'll need to tell your email program to use it when you send mail. When you reply to a message, or when you compose a new one, your email program should allow you to select which account to send as; it will probably default to your regular account. Select this new one, and you'll send as "me@example.com", meaning that's who the email will appear to come from. If you're concerned that this technique might somehow be used to hide your identity or pretend to be someone you're not remember that the the mail header information that you normally don't see will still contain information about where the mail was sent from. Here's a video walking through the changes described above using Outlook 2003 as an example. hi.. i would like to know in detail of how to send an e-mail from my webpage using asp. i tried cdonts... its running fine with out errors but.. i'am not getting the mail into my inbox.. i dont know where the mail sent is lost..
can u help me.. ? I have run into some problems with this where some recipients do not recieve my emails - it seems that they are treated as spam since the from address does not agree with the actual IP address of the domain that is sending the email. Any hints on this problem? Well, you've mentioned three different types of email: exchange, internet, and web-based, so I'm not exactly sure what the scenario is you're looking for. 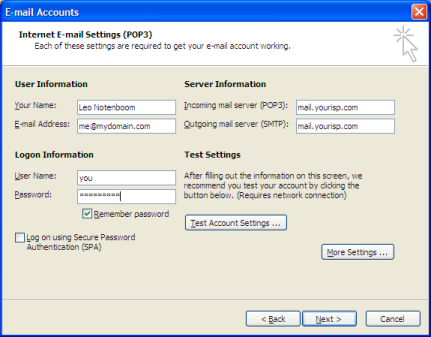 But you can create as many accounts as you need in Outlook 2000, and configure them as needed, as tha article outlines. The account should not download email, unless it's to be your only account. Your email arrives via your regular account only. How??? How do you tell outlook not to download mail for this account? Good point - that's not obvious in Outlook. Tools -> Options -> Mail Setup -> Send/Receive -> Edit ... now on the left, click on the account you want NOT to recieve email, and then uncheck "recieve Mail Items". You can investigate the other options in that dialog as well, but that's the biggie. can I configure the exchange account to send automatic CC: from one account to other specific account I specify it. In outlook there's an "account" selector that appears, or you can add to the compose mail window by customizing the toolbar. Yes - there is an accounts drop down. Previously when all the pop accounts were listed, now the accounts bar lists only two accounts: "Microsoft Exhcange Server" and "Fax Mail Transport"
Yes In outlook there's an "account" selector that appears on the toolbar but please do you know how to set up a default forwarding e-mail account. There have 3 Mailbox, MailBox1,MailBox2, Mailbox3. when Mailbox1 send a mail to Mailbox2, user received this mail in Mailbox3 via OWA, not Outlook, and reply, the problem is at this time the default sender is Mailbox3 instead of Mailbox2, does anyone can help me out? Thanks! You're a star, mate. I've been getting double double downloads downloads of mail since setting up new account. Now all fixedthanks to your clear instruction. Keep up the good work. Anyone know if it is possibile to have an exchange server automatically foward emails to another account? Say if I have a user with the Name USER1 and email USER1@MYURL.COM and the user quits and I want to foward all of their emails to another account say USER2 who has the address USER2@MYURL.COM. Can i do this on the exchange server side? This works really well except that I can only login one at a time to the pop server so I get errors - I can't figure a way of setting up an outbound mail only account, or only doing 1 account at a time. Any ideas? You'll have to talk to sbcglobal.net's customer service. This is absolutely wonderful. Thank you so much. Other sites say it can't be done but I perservered and found your site. I can't thank you enough. Works perfectly in Outlook 2007. Finally I can send 'from' my domain name as well as have emails fowarded from it, making it possible to change ISP without changing my public email address. Clear instructions, worked first time in Outlook 2002. Great site. I tried to go through this but am having problems figuring out how to set it up in Outlook 2003 with my primary email being an aol account and my secondary my business account through my registered domain (info@companyx.com). i was able to auto-forward that email to my aol account, which is then in turn coming into Outlook, but I can't figure out how to have the option to respond from the business account. i'm not sure if it's the fact aol uses an IMAP email server? Any insight would be greatly appreciated! I'd love to have all my emails funneled into Outlook, which I use religiously, while having the option to respond from the right domain. Thank you. Leo, this might sound dumb, but if I want to send one email to more than one person, How can I bring up all their addresses with one click? That depends entirely on what email program you use. "One click" is unlikely in all the ones I can think of, though. I had my business dsl internet connection w/AT&T disconnected due to an office closing. AT&T offered me a dial-up service to keep my sbcglobal.net email account open at $15.99 per mo. Is there another solution that will automatically forward my emails to a web-based or client based account when clients email my former sbcglobal.net address? Please help, AT&T email account due to be erased in another week. hi leo, i use outlook express. i want to receive my mail on my adress at home but i also want to be able to view it at work. how do i accomplish this without losing any mail in the process. second, I did exactly as you said, and although in my Sent Items the emails are listed as coming from the new address, but when received the original address appears. I'm using Gmail, does that cause the problem? I use Microsoft Entourage on a Macbook Pro, and I cant seem to get this method to work for me. I changed the "Account ID" to my domain email [email address removed] (@customdomain.com), but when I send an email, it still says its from my ISP email [email address removed] (@gmail.com). Any thoughts? I'm changing from 1 isp to another and the new email account will not be opened until they turn my account on. I can use outlook express on my old account to set up forwarding rules, but cannot see them arriving at the new email address until after the switch, at which point I will only be able to access the old email address via hotmail, which does not have forearding rules available to it. A bit of a catch 22. Any ideas? Your system worked fine with Outlook 2007. Hi Leo, I have done what you suggested in getting a domain name. I am now moving my dsl from earthlink to dslextreme. How do I move all my contacts, email addresses. ect. to this new location. If I'm understanding your questions, you are only changing your internet provider and your email has been coming through your own domain. If that's the case, you don't do anything at all. All the new DSL company does is gets you online, everything you have set up between your home machine and servers on the internet stays the same.